I can�t believe this band is signed to a major label. This CD sounds like what the cars would have sounded like if they had no talent. 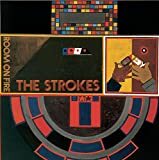 With shotty, poorly recorded vocals that tread over choppy, clumsy guitar and mediocre drumming, I have to say I was not impressed at all with this record, or this band for that matter. The sound recording is substandard, that wouldn�t matter with acts that actually sound decent, but this band just doesn�t have it together. To know that something like this could even belly up and get heard outside of small venues is a depressing and terrible sign for modern music.